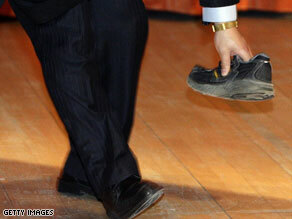 Shoe-Throwing Taking World By Storm! The shoe. Look at the big honkin' sole on that thing! I do remember thinking when that Iraqi guy did it that it was the sort of simple-but-obvious thing that was likely to be replicated. What, are they going to make everyone take their shoes off at any sort of public event? (“They” being anyone who is in the business of protecting a high-up muckety-muck who faces a possibly disgruntled public.) Make everyone wear Crocs? I had originally thought that this happened in China and that the thrower was Chinese, and actually stopped at this point in my draft last night because I suddenly worried what would happen to the thrower. I read about it this morning, though, and evidently the whole thing happened in England (a speech at Cambridge University) and it’s unclear what nationality the thrower was but he may have been German. Evidently the Chinese media doesn’t want to give anyone any ideas, though — for a while, they left out the shoe-throwing from accounts of the speech. Chinese blogs went ahead and talked about it, leading (?) the media to break its silence. Wait – why couldn’t you throw Crocs? Do they have fatal aerodynamic flaws? Or is it more a matter of etiquette? It should be easier to get a nice grip on ’em, what with the holes and all, and the shock of colour would add to the assault! You COULD throw Crocs but they are so light and puffy that they wouldn’t do any damage to the target. It’d still be mean though. Hmm.. I see your point. Maybe, if it’s gonna be mean anyway, just go with a nice pair of boots. Not army boots of course, that’d be terrorism. Ladies’ boots. With heels.